Looking for show feed? If you raise show animals, Ocala Breeders’ Feed and Supply is your go-to source for show feed. We’ll help you and your animals look their best to be competitive in the show ring. OBFS is proud to stock Honor Show Chow by Purina Mills. We carry show feed for a variety of show animals including cattle, swine, goats, sheep, poultry, and rabbits. We also stock a line of show animal supplements to give your animal that extra push to reach their optimal potential at show time. Purina’s High-Octane Show supplements have proven to have champion results with show animals they are fed to. Need advice on your show animal? Ocala Breeders’ Feed and Supply staff offers long time experience in knowledge in getting animals ready for show time. We will be happy to advise you on your feeding program. Contact us or stop by either of our two retail locations and visit with one of our knowledgeable staff members. Let us help you raise your champion. (need this on our site) Read how your student can earn Honor Show Chow Reward and participate in the Honor Show Chow Top Performers Program. 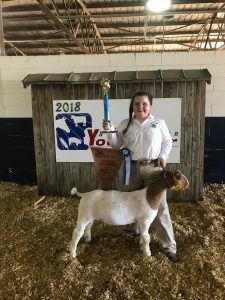 We appreciate the hard work that goes into raising a show animal. Ocala Breeders’ Feed and Supply stocks a full line of supplies you need for project. You can find washing and grooming products, halters (both for breaking and showing) as well as collars for your goats. Whether you are working to grow show hair, or needing a lamb blanket, OBFS has your show animal needs. If by chance you don’t find what you need, we will be happy to special order it for you. Stop by any of our two locations and browse our wide selection of show feeds. Let Ocala Breeders’ Feed & Supply help you show your best. Be sure to browse some of the products we stock below or contact us for more information.